There are a lot of benefits to being able to share your screen over the Internet to others. For example, say you need to show someone how to recreate a project, present information in a webinar format, or show a specific skill or talent to an audience that may not be able to physically look at your computer screen due to distance or space constraints. How you go about doing this, however, is a bit tricky. If you're not used to video conferencing — even tangentially — you might be unfamiliar with the process of using such a program. After all, computers generally do not come with the ability to screenshare out of the box, so you have to go through the process of finding a third-party program or plugin to do this for you. After installation, you've got to get the program up and running and that usually involves a bit of calibration and learning the interface. Once you've gone through the initial setup, though, you can easily share your screen to anyone with an Internet connection. This guide focuses on how to make sharing your screen easy and productive, with helpful tips for selecting your program, walk-throughs on how to use specific types of software, and great tips and tricks for creating an effective presentation. Before you start sharing your screen, it's a good idea to take some time to learn about video conferencing if you've never actually tried it out before. Here you'll learn the ins and outs of video conferencing, as well as tips and tricks that are sure to make sharing your screen, video conferencing and long-distance collaboration in general quite a bit easier. Video conferencing is a bit of a tricky subject at first. It's one thing to talk to people who are in the same room as you, but talking to people via the Internet is a bit more difficult. Get a head start on learning how to conduct long-distance conference with this collection of tips and tools. You might be asking yourself, "What does VoIP have to do with sharing my screen?" but if you plan on asking for feedback or want to share your screen in an online meeting, you'll likely want to use a program that handles voice chat. Take the time to check out these tricks and tools for this invaluable topic. Sharing your screen with people means little if you can't manage to get people together in the first place. Here you'll learn tips and tricks to scheduling a successful video conference, such as the importance of making sure everyone can run the required software, making sure there are no schedule conflicts, and making sure everything on your end is planned out well in advance. When it comes to sharing your screen with people, you might be surprised to learn that there are a few different ways you can go about doing this. Usually, if you're sharing your screen, it's in one of two settings — either a webinar or an online meeting. Here you'll learn the merits and flaws of each type of online conference, which should help you make a decision as to what software you should be looking for. One of the most common ways people share screens and presentations with others across the Internet is in a webinar. Webinars — a portmanteau of "web" and "seminar" — are a fantastic way to provide updates on projects, provide training to employees and offer online lectures. Here you'll learn some tips for running a successful webinar, from how much information to present at a time, to focusing your content better, as well as why it's important to test out your software before you start. If you're looking for a great tool to start sharing your desktop with others, why not try out CrossLoop? Here we feature a review of this collaborative tool that is designed to easily share your desktop with other people. Not only does this review include helpful insight into CrossLoop, it also takes you through the installation process, as well as the basic operations of the program. Using Skype to host a video conference is surprisingly easy to do on any budget with almost any level of experience, so it's fitting that there have been a myriad of third-party Skype plugins and extras that are designed to make your collaborative efforts a little more rewarding. This article includes a collection of ten extras, including whiteboards, conference call recording, and of course, a few screen sharing extras as well. If you're looking to compare a few different applications to help share your desktop, check out this comprehensive list of programs. It includes applications that work with Windows, Mac and Linux computers, offer the ability to work as stand alone programs or with existing programs and accounts such as Skype and Google accounts. Here's another list of fantastic screen sharing tools that are designed to make the most out of your collaborative efforts. These ten tools, however, are designed to allow people to access your live stream of your desktop directly from the web, without having to download any software, making this a great option for shared computers, business conferences and more. Google Talk has quickly become one of the most popular instant messaging programs for business partners, primarily because of Google's expansive collection of productivity tools. For those of you looking for a way to incorporate screen sharing into training programs, conference calls or meetings, you can follow this helpful guide which takes you through the process of adding screen sharing capabilities directly into GTalk, allowing to share your screen easily with anyone who has an Internet connection and a Gmail account. 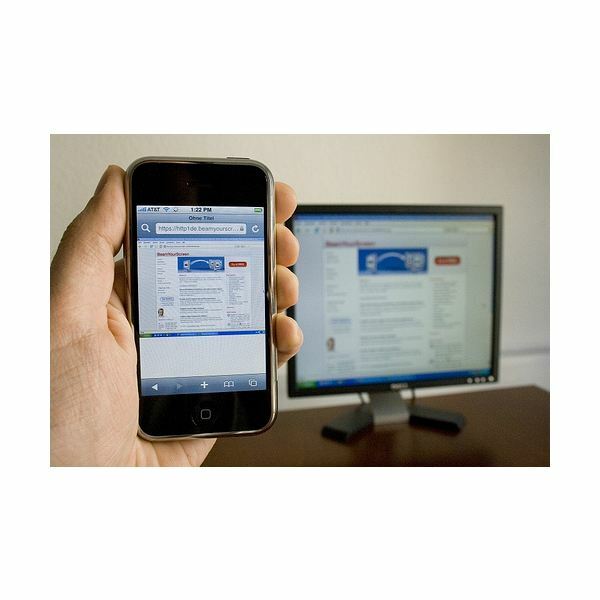 Screen sharing has more than just demonstrative purposes, as with some programs you can also assume control of another person's computer — with their permission of course — to fix computer problems, demonstrate how to complete a task, or view files and/or programs that may be difficult to transfer. This article guides you through the steps of remote desktop sharing with iChat, making this a fantastic option for Mac users. Some of the best things about webinar software are that it is almost always designed specifically with screensharing in mind, is made to be accessed by people with an Internet connection and rarely requires viewers to download any extra software before they can join in. Here is a list of five fantastic webinar software options, so you can share your screen quickly and easily.